Earlier in the week, I mentioned how I like natural textures, and taking photographs of anything weathered and worn. This tutorial was inspired by a weathered picket fence. 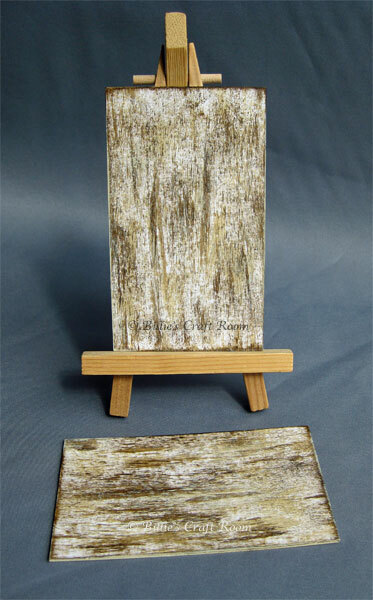 The technique is quick and simple and because you can creat this with a flat finish, its ideal for cards, art journals, ATC as well as book covers and altered art surface decoration. Join me in this latest instalment of Adventures in Acrylics to create a weathered wood, paint effect. I am working on white mount board, that hasn’t been gesso’d. You can also use other board but for this effect you will need to apply a layer of white gesso to it, to give you the white base. That does affect how the paint will move on the board though. Put some buff Titanium onto your palette. Choose a direction for your wood grain. Dab your car sponge into the paint to pick up some colour, then dab off the excess paint on to the palette, this also blends the paint into the sponge. Swipe your paint across the board, in the direction you chose for your wood grain. You just want to catch a few areas here and there, this is to create some texture, rather than covering the card. Let this layer dry completely before you move on. Put some Raw Umber out onto your palette, dab into this paint using a clean area of your sponge. Dab off onto the palette before moving to the board. Apply this colour by swiping the sponge across the board in the same direction you did for the lighter colour. Allow this layer to dry before you move on. To get the best results you want to break up any large areas of colour, layer over particularly dark areas with the titanium buff, and over light areas with the Raw Umber. Let layers dry between coats or the paint will merge together rather than tone down the earlier layers. Continue these last few steps until you have an effect that you like. I have written the instructions as well as the video, so that if you don’t speak English, there is always the trusty Translator 🙂 I’ve put a link to one, in the side bar. 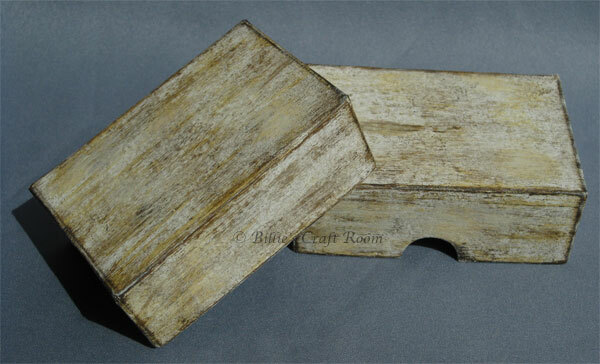 Here’s a paper mache box that I decorated using the weathered wood paint effect. The Winsor & Newton Galeria, is a flow formula acrylic paint, if you want a more textured effect try using Daler Rowney Cryla as that is a heavy bodied acrylic paint. The consistency of Cryla is more like that of toothpaste, so will leave a more textured result. Try altering the colours for different base wood effects. Since making the film, I’ve noticed the Cryla equivalent; called Titan Buff and is not as yellow as the Galeria Titanium buff paint. This is not a problem if you apply the Galeria one lightly, but it will need more careful blending if you get larger areas of it on this project. If you want to seal in your colours, apply a layer of matt medium over the whole piece, this takes a while to fully dry but does not affect the colours. I’ll be going into more detail about mediums, later in the course. For suppliers: Check out the Art tab at the top of the blog, for manufacturers and retailers. They will be in the supplies section. For more information about the Online Workshop series Adventures in Acrylics, check out the dedicated Workshop page. Hope you enjoyed today’s tutorial and will give this technique a try, I’d love to see your results. Do leave a comment and a link to your projects if you post them on your blog. such a ‘simple’ technique and with a wonderful effect. thanks for sharing Billie! Thanks 🙂 Glad you liked it. Its all about the blending to get the best results with it. I really like how your weathered wood turned out. I will have to try your technique. Thank you for sharing. Thanks for linking to me, my only concern there is that the wording currently suggests that this technique is suitable for making wood look aged. My techniques are based on working on card or paper. I have only tried this technique on mount board, and couldn’t say what the results would be if used directly on to wood. Also the specific acrylic paint I am using is artist quality, not sure it would be suitable for home decor or external uses. If you try the technique on wood, do let me know the results, it would be interesting to see how they turned out. Billie, I’m so sorry for not making that clear Thank you for letting me know. I will correct that as soon as possible. And I will have to try that technique on wood and let you know. No Worries, you got me worried that the way I titled the piece might have been misleading too. Weathered wood is a popular term in the papercrafting world and as in the tutorial I specify the surface the technique is put on to, is mount board, I think its ok. If you could just clarify that the technique you are linking to was originally intended for a mountboard/ thin card surface, and any further experimentation is optional. Do let me know how you get on, if you try it on wood. Great technique; gives a very effective result & your video & instructions are very clear & easy to follow. Thank you. Thanks 🙂 Glad you enjoyed it, would love to see your results with it, if you give it a try.